I’ve always been fascinated by the change up. Slower than a fastball, with less movement than a typical slider or curveball, it thrives on deception–appearing to be something other than what it is. 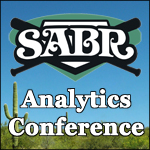 According to the pitch f/x data, 92 starting pitchers have thrown change ups this year. On average, they account for about 14% of their pitches, are 7.6 miles per hour slower than their fastball, move a total of 11.8 inches. The vertical movement of the change up accounts for 4.4 inches per pitch, or about 37% of the total movement of the pitch. Some pitchers throw a change up one-third of the time (Justin Verlander), while others throw it as little as 1% of the time (Edwin Jackson). 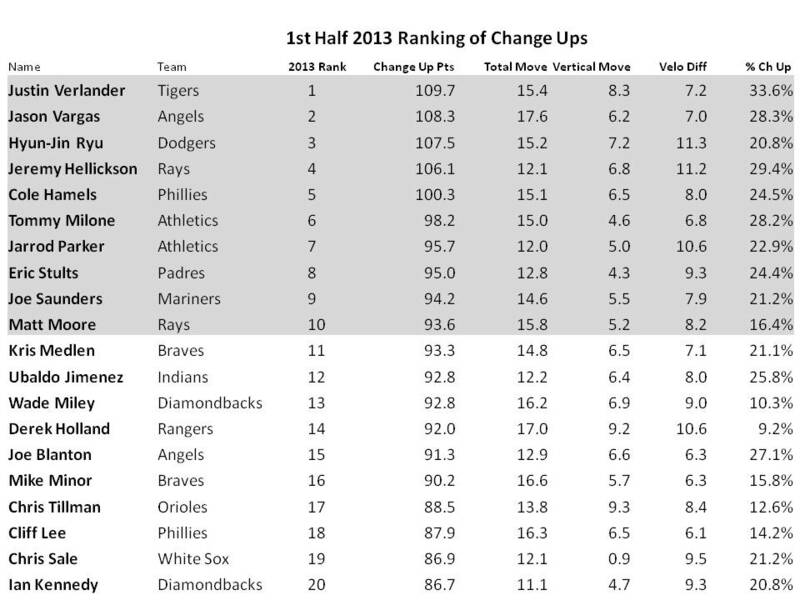 Which starting pitcher has the best change up in baseball for the first half of the 2013 season? I’m not in favor of looking at the batted ball results of change ups put in play, as it can be a misleading measure. No one pitch-type can be judged by how batters perform against it, in isolation. Pitches live and die by the sequence that precedes them. A change up that follows a fastball is very different than a change that follows two previous change ups. (In a separate analysis, I’m in the process of evaluating pitch sequences and developing a system to “value” sequences of pitches, rather than stand alone pitches.) For the purpose of this piece I rated pitchers’ change ups based on four factors. I looked at the velocity differential versus the pitcher’s fastball and the total movement on the pitch. I also factored in the percent of a pitcher’s mix of pitches, giving a pitcher more “credit” for using the pitch if it were say, 20% of his pitch mix versus 5% of his mix. Finally, I gave additional points to a pitcher for his vertical movement. Although it is already included in total movement, I placed a premium value on the drop of a pitcher’s change up, effectively double-weighting it. The net result is a points system that rates the change ups thrown this season. At the top of list is Justin Verlander. His velocity differential is around the league average of 7.2 mph, but his total movement, vertical drop and percentage thrown are all well in excess of the MLB-wide average. Closely behind Verlander are Jason Vargas, Hyun-Jin Ryu and Jeremy Hellickson in second, third and fourth place. Ryu and Hellickson (along with Clay Buchholz) have the highest velocity differential versus their fastball at over 11 mph. Vargas (followed by Derek Holland, Mike Minor, Cliff Lee and Wade Miley) have the greatest total movement on the pitch, all exceeding 16 inches. The number 5 rated change up belongs to Cole Hamels–the top ranking change up artist, applying the same formula to 2012 data. Tommy Milone, Jarrod Parker, Eric Stults, Joe Saunders and Matt Moore round out the top 10. The Ray’s and Oakland A’s each have two starters in the top 10. Like this Vince! I’m also becoming more and more interesting in pitch sequencing. I’m curious about Holland. He came into the league with his change up supposedly being his best secondary offering, but then has thrown it less and less each year. In spring training/April, he worked on it a lot, was getting good results with it. But now it is down below 10% of usage it looks like from your numbers. But his FB-CH velocity difference back, higher actually than every in the early part of 2013. He seems to love his slider, and certainly his season has been going well for him, but I’d love to know why he’s shied away from it again recently.